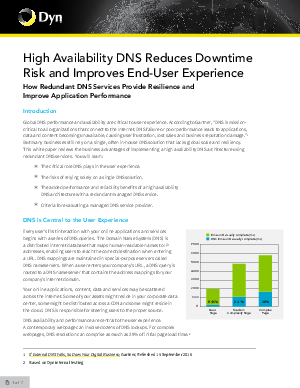 Global DNS performance and availability are critical to user experience. According to Gartner, “DNS is mission-critical to all organizations that connect to the internet. DNS failure or poor performance leads to applications, data and content becoming unavailable, causing user frustration, lost sales and business reputation damage.” But many businesses still rely on a single, often in-house DNS solution that lacks global scale and resiliency. The critical role DNS plays in the user experience. The risks of relying solely on a single DNS solution. The added performance and reliability benefits of a high availability DNS architecture with a redundant managed DNS service. Criteria for evaluating a managed DNS service provider.